Anthony Bourdain once said that to maintain a slim physique and not succumb to the effects of holiday eating (or eating for sport), he skips breakfast. Perhaps I should have listened to him but sometimes when you hear of things like pineapple brioche French toast, well all sage advice becomes muted. 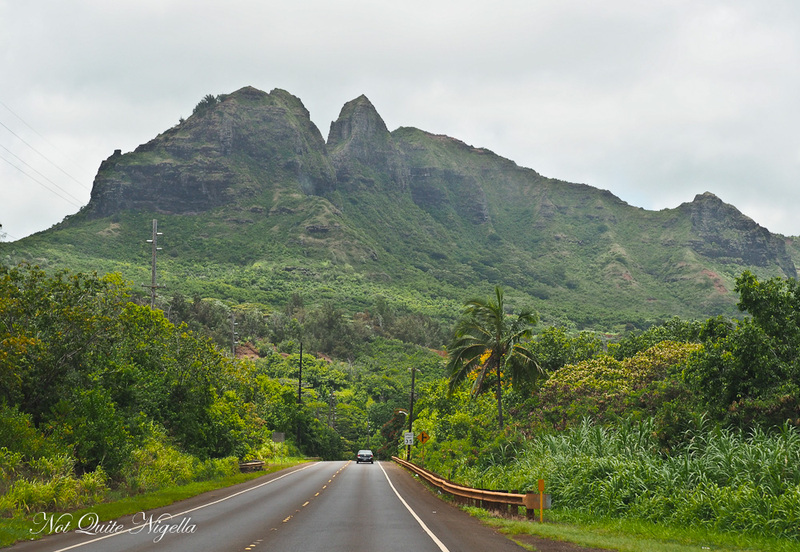 We are leaving Poipu and retracing our route back past Lihue and Kapaa to the Northern-most area of Kauai to Princeville, home to the jetset and celebrities. But first things first is breakfast at the Living Food Market in Poipu. A Whole Foods home away from home, the market is ideally stocked for self catering. Some criticise the store for its high prices but the breakfasts are reasonable (well for Sydney standards where $20 buys you breakfast at a cafe) but here you pick up and bus your own plates. In the store, admittedly the food is on the expensive side with bags of healthy chips at $9 a bag. 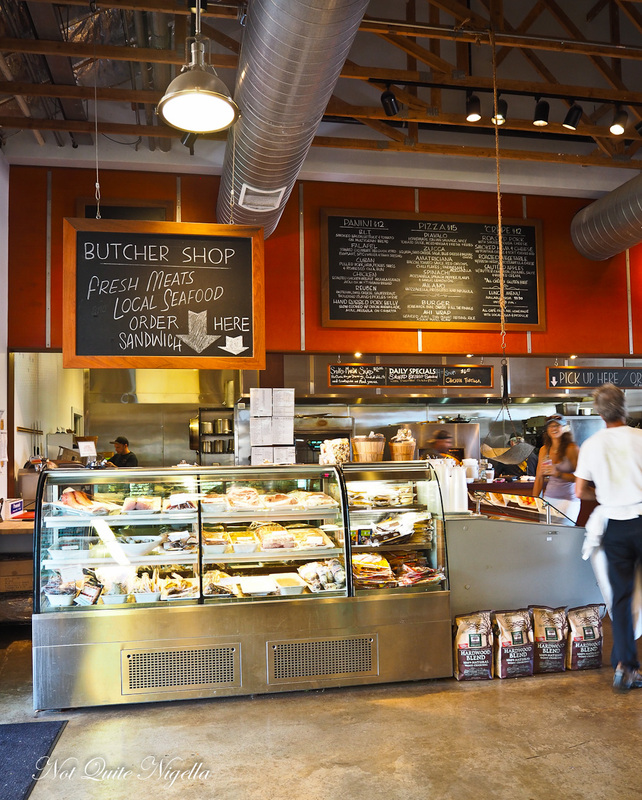 There is a good range of beers and wines and ready to make foods like pizza dough and an excellent range of meat and prepared salads. 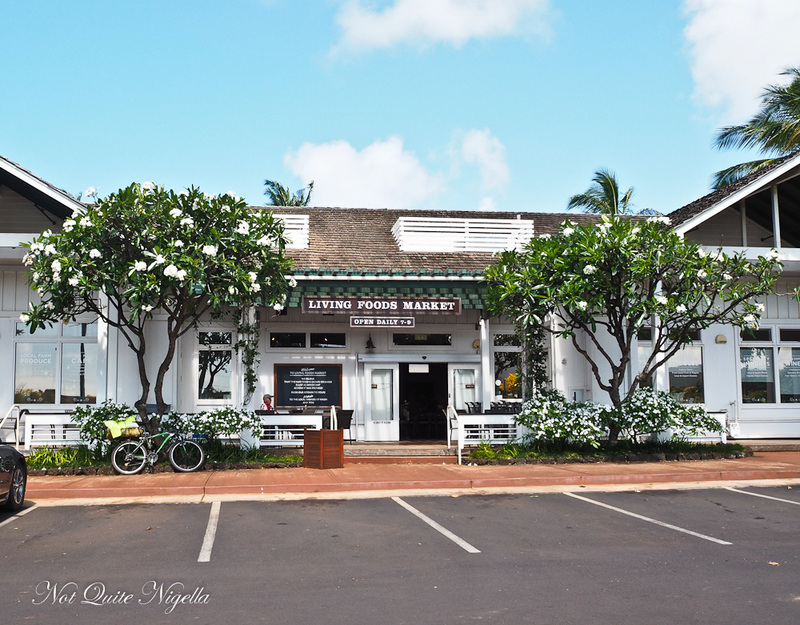 It is a popular place though as it stocks items that are otherwise not easy to locate on Kauai. 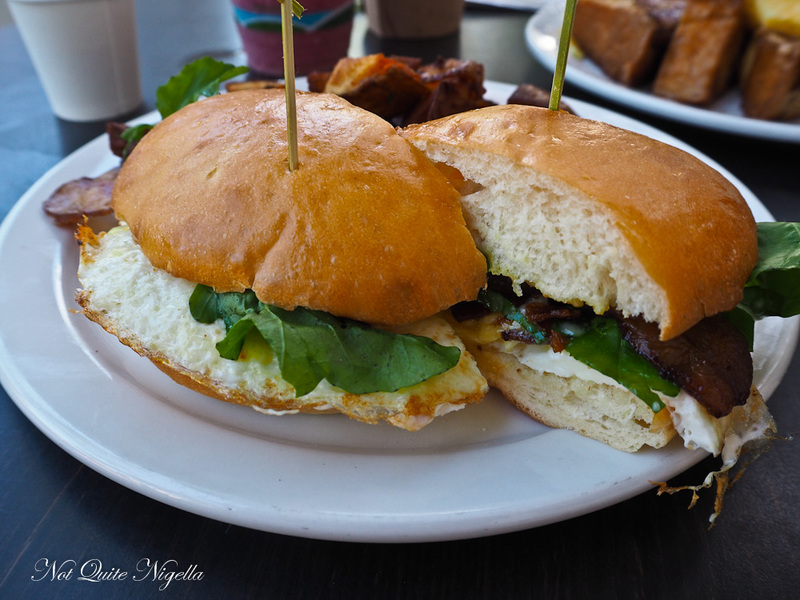 We were told that the most popular item is the fried egg sandwich so we order it. I am strict with my three bite rule on this. The bread is surprisingly soft like a brioche roll. There's one thin slice of crispy bacon and two really good fried eggs with runny yolks as well as cheddar potatoes with caramelised onions. I only wish that there was more bacon because the roll is quite large. 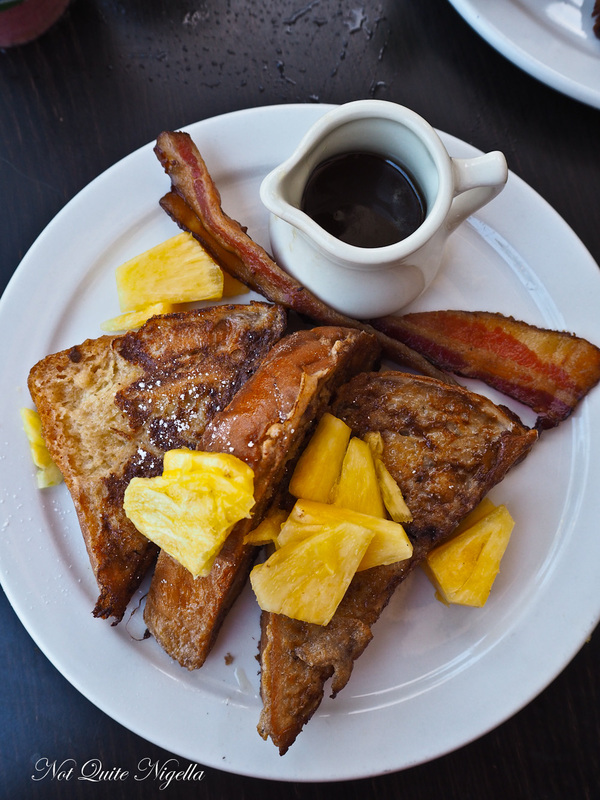 The French toast however is sumptuous - made with pineapple brioche, thick cut bacon and maple syrup. It is all sorts of decadence. "Take this away from me," I say to Mr NQN miserably as my dress digs into my mid section. Ugh. We are now ready to drive north. There are rugged mountains covered in greenery with exposed red dirt form the landscape for miles. Wide roads turn into one narrow two lane road. 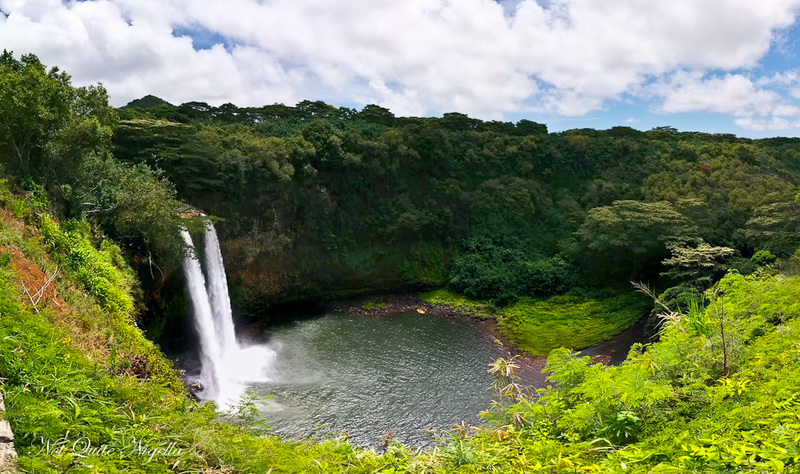 The first postcard stop is Wailua Falls, near to Lihue, about a third of the way on our journey. Some may recognise the 113 foot waterfall from the opening sequence of Fantasy Island. It's a popular place for tourists to stop and the tiny car park is located at a dead end (spaces do free up frequently). 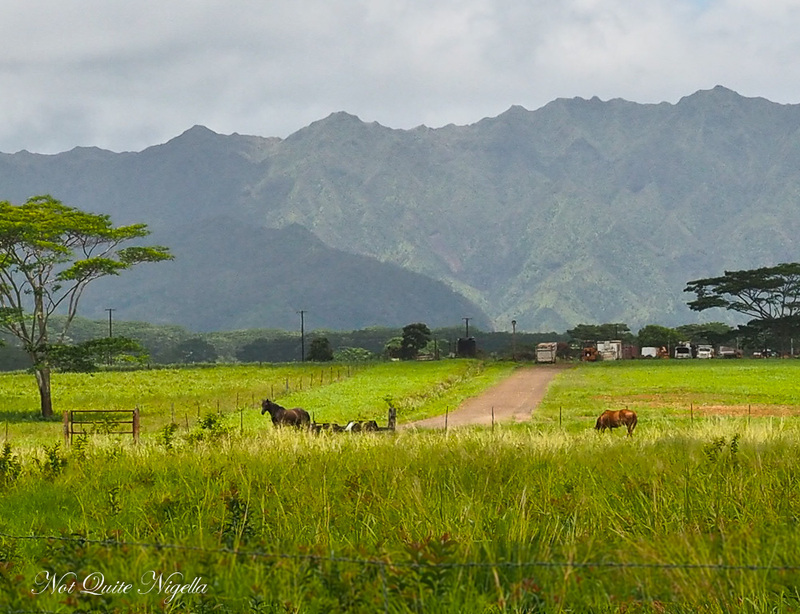 We keep driving north passing by farmland where horses and sheep graze. It's easy to see where the sugarcane and pineapple would have grown. 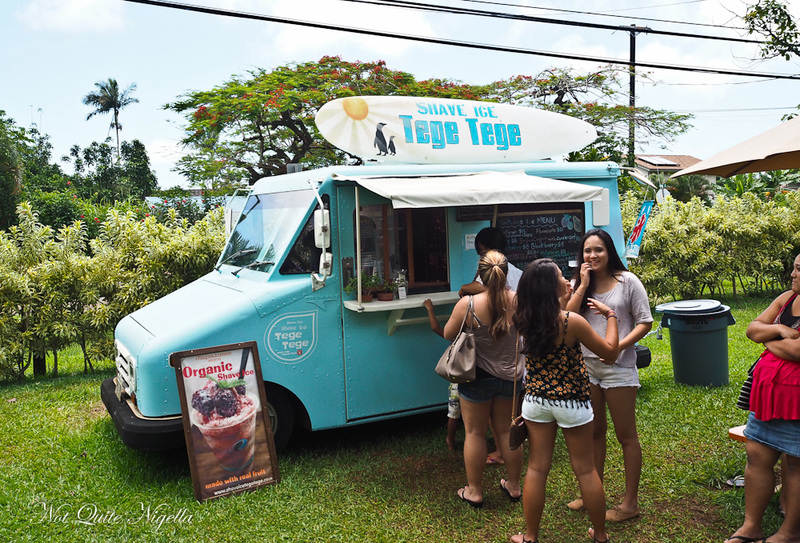 We pass through Kapaa which is busy this Saturday afternoon and head up the hill past the food trucks - there are stalls for bbq, tacos and fresh coconuts and lychees. 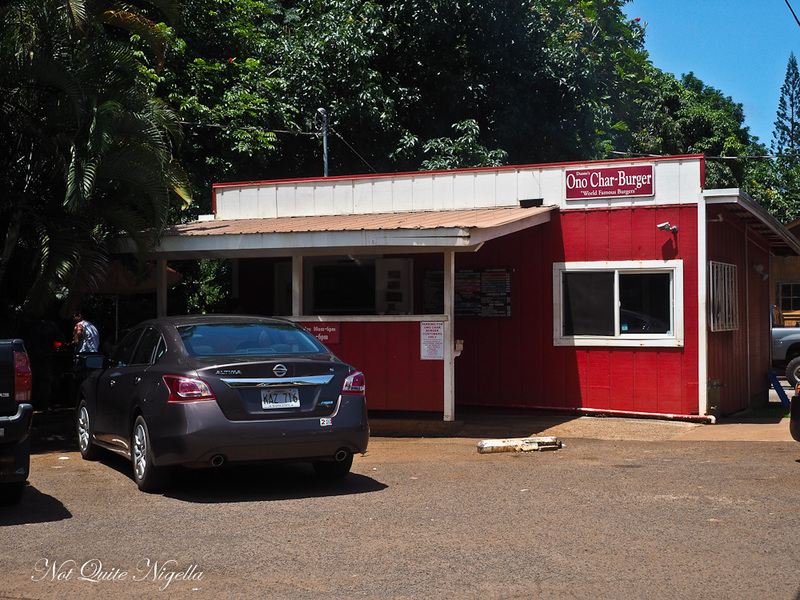 Our lunch time stop is Ono Char-Burger, an unassuming burger shack next to Whalers General Store in Anahola about 15 minutes from Kapaa. 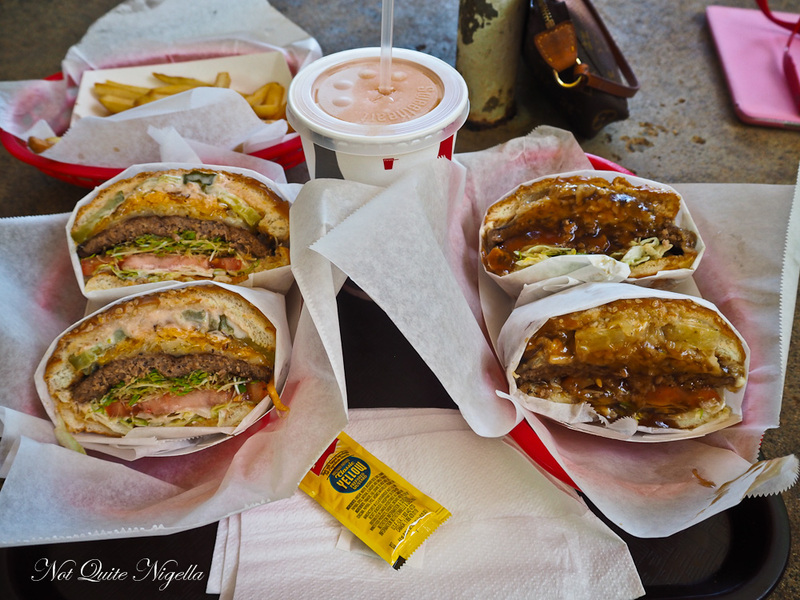 It doesn't matter that there is no In-N-Out Burger in Hawaii. 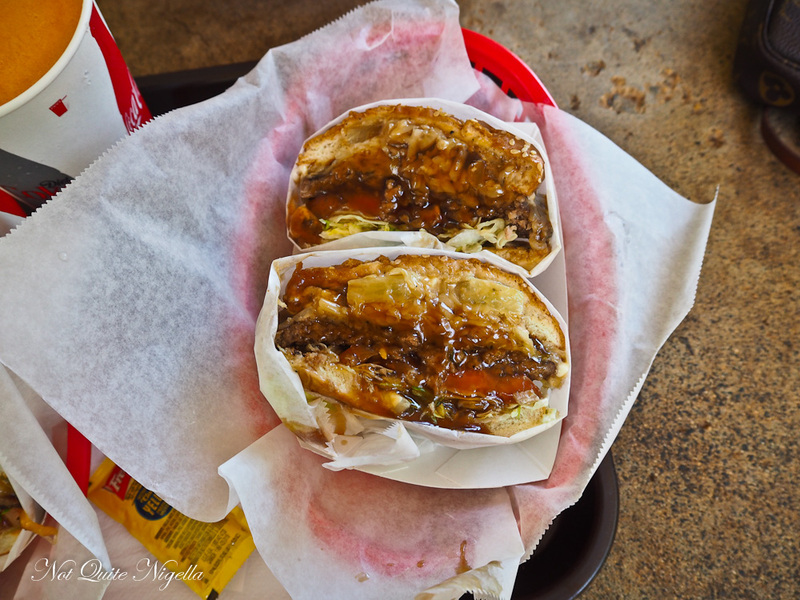 In-N-Out Burger obsessives swear that Ono Burgers are even better. 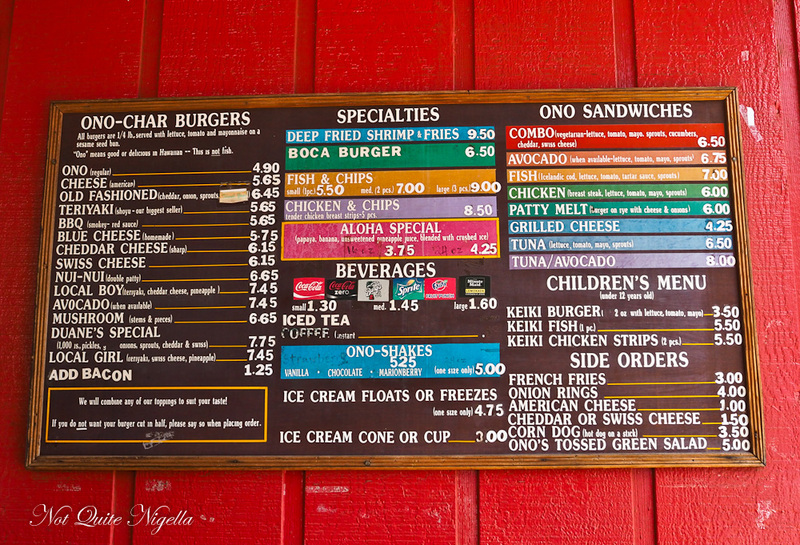 Ono means delicious (it's also a type of Hawaiian fish) and after buying some provisions at the general store next door, I regard the menu at Ono Burger with lascivious lust. Burgers are topped with blue cheese, teriyaki sauce and avocado. "It will be a 40 minute wait for food," the woman behind the counter tells me. Yep, the burgers define slow cooking but for us, we're not in a terrible hurry and we go for a short drive to take some photos and use a restroom and then head back to Ono burger with about 30 minutes to go. 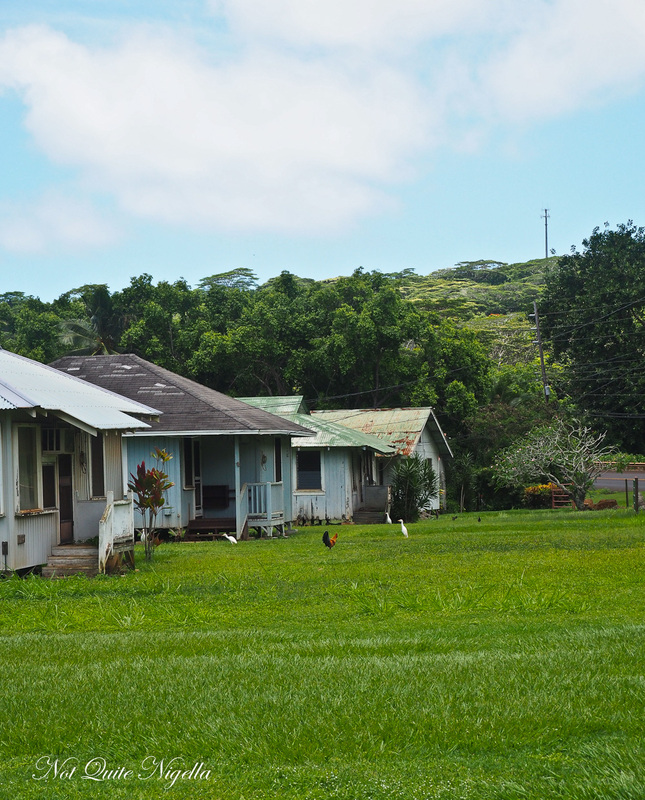 The eating area is Chickenville with numerous Kauai chickens hoping for a stolen or volunteered chip. We share a shaded table and chat with a friendly couple from Washington State who offer us some of their chips and before we know it, our time is up and they call my name. 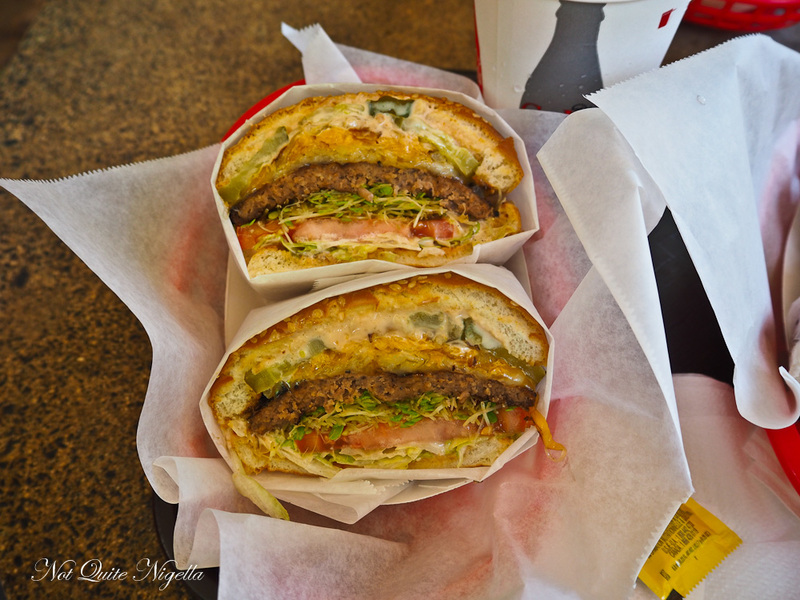 All Ono burgers are cut in half and served open side up. There is a "Local Girl" and a "Local Boy" burger - the difference is that the Local Boy burger has cheddar cheese while the Local Girl has Swiss. It's a saucy burger with a beef patty, tomato, lettuce, teriyaki sauce, Swiss cheese and a ring of pineapple. I'd have loved a bit more seasoning on my burger but I like the freshness and the wholesomeness of the burger. My favourite of the two was Duane's special. I'm a pickle lover and the description that read "1000's of pickles," swayed me. It's a slightly unusual combination with a beef patty, pickles, onion, sprouts, tomato, lettuce, Swiss and cheddar cheese with a slightly spicy mayonnaise on it. Sprouts on a burger? Yes, and they taste delicious! I wonder how Hawaiians would react to the Australian beetroot slice on a burger? We climb into the Jeep again (arrgh, I'm just too small for these cars!) 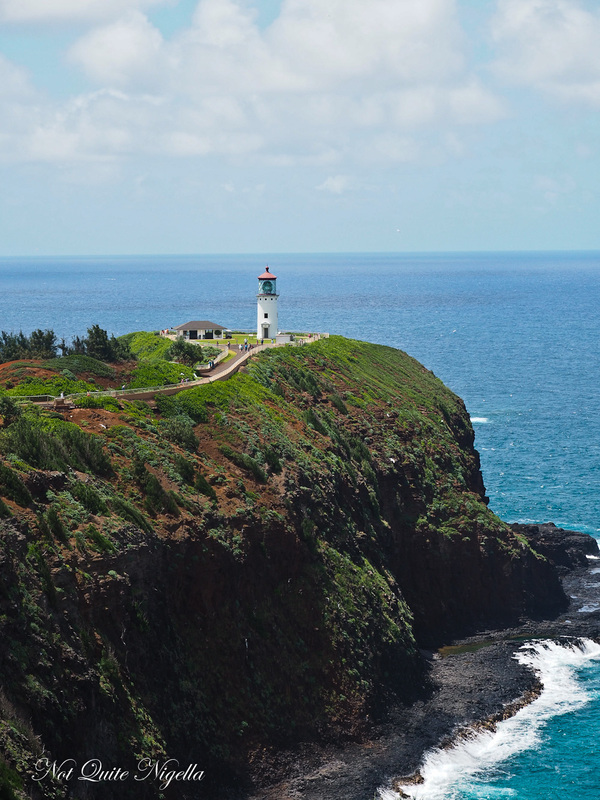 and continue our journey north towards Kilauea Lighthouse and Princeville. Our first stop is just before we reach the Lighthouse for a hot weather salve. 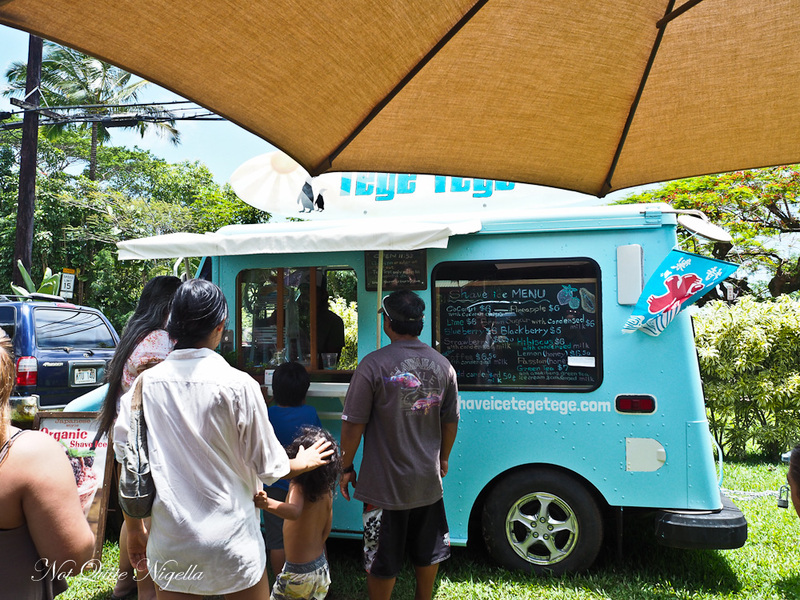 Shave Ice Tege Tege is reportedly one of the island's favourite secret spots for shave ice. 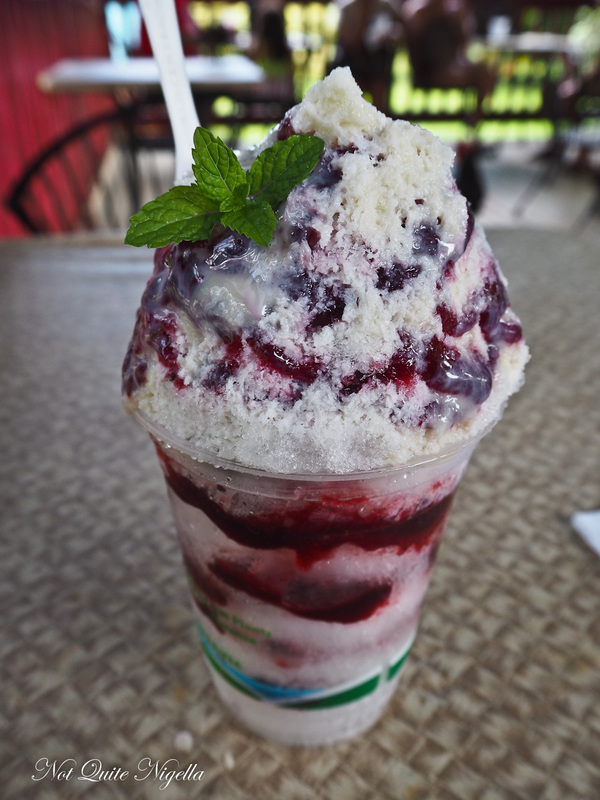 Eiataro Hisahara from Amami in Japan has built himself quite a reputation for Japanese style organic shave ice. He uses only real fruit syrup and after he sells 100 shave ices, the van closes down and he is done for the day. If the truck's silhouette looks familiar, it's because it's a painted UPS postal truck painted aqua. The queue for this little hidden away van (missed by us not two but three times because of the lack of street signage) is always there and it moves slowly. Tege Tege is Japanese meaning "just right." The syrups are made by Hisahara with either organic cane sugar or honey in a country where high fructose corn syrup is the sweetener in so many items. The passionfruit has already sold out. 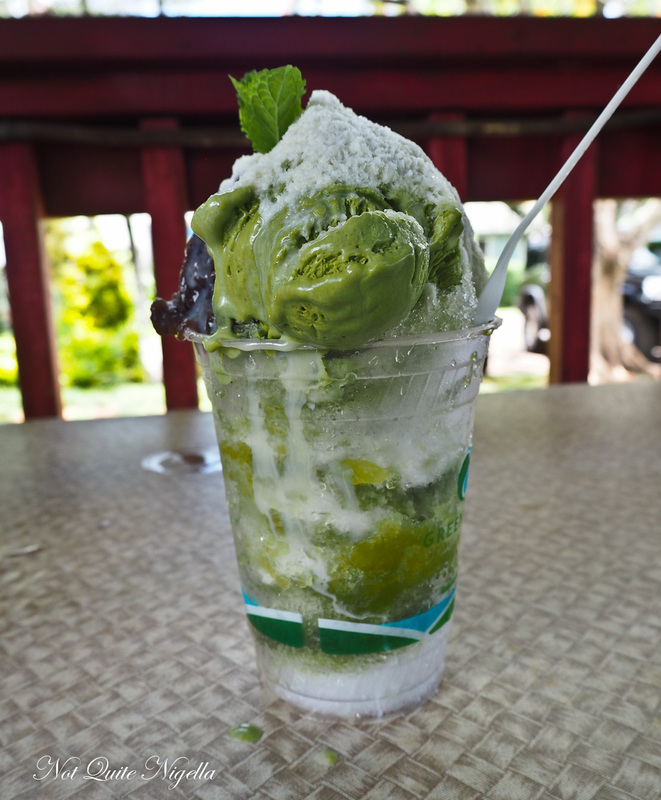 The reason for the wait is that Hishara makes each ice individually himself and carefully adds a layer of hand cranked shave ice and then another layer of fruit syrup then more ice - this can go on for up to 5 or 6 times per cup. He then spoons on fruit or a scoop of ice cream and then finishes it off with small mint leaves. 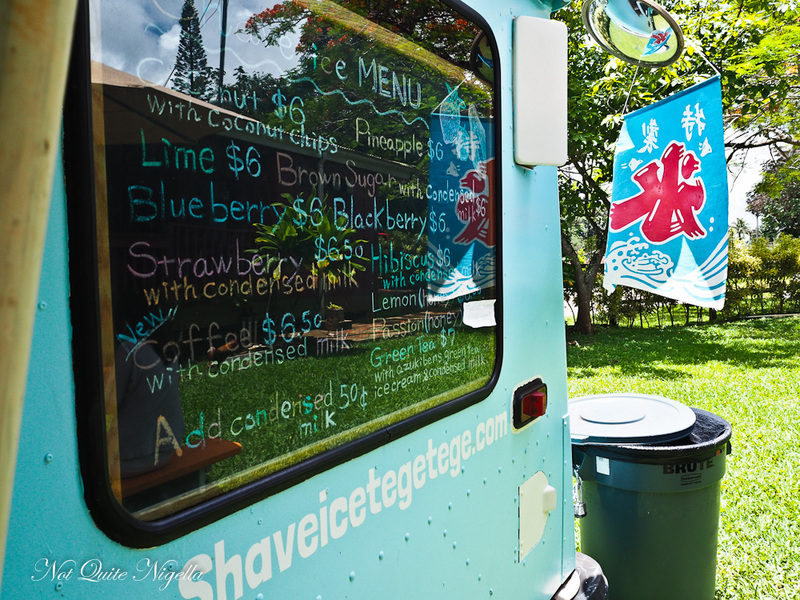 His English is minimal but the way that he makes his shave ice is very Japanese - absolutely meticulous. He hands you your change like he is exchanging a business card - two hands accompanied by a thank you and arigato. We take our ices to the tables nearby. The blackberry is tart with real blackberries layered three quarters of the way up. The extra sweetened condensed milk is for me, I love the stuff and it gives the top a sweet creaminess but once this is gone, it's pure, refreshing blackberry. The green tea shave ice is the most popular and it's easy to see why. Layered with ice and green tea syrup he also add a scoop of creamy green tea ice cream to the side and a spoonful of sweetened azuki beans to the top as well as condensed milk. It's sweet and delicious and you can certainly see why people queue for up to 30 minutes to get their fix. With our brows soothed by the cool ices, we take to the road again to visit The Lighthouse. Built in 1913 the 200 foot lighthouse underwent a huge restoration project in 2006 to 2013 helped by donations from locals and others (actors Ben and Christine Stiller were some of the donors and they also have a house on the island). Entry to see the lighthouse closeup is $5 per person or you can view it from a distance from a nearby lookout just before the entrance to the national park. A variety of bird wildlife can be seen from the Red Footed Boobies that create small burrows on the sides of the cliff to a Nene bird. We reach our home for the next two nights on the waterfront area of Princeville. 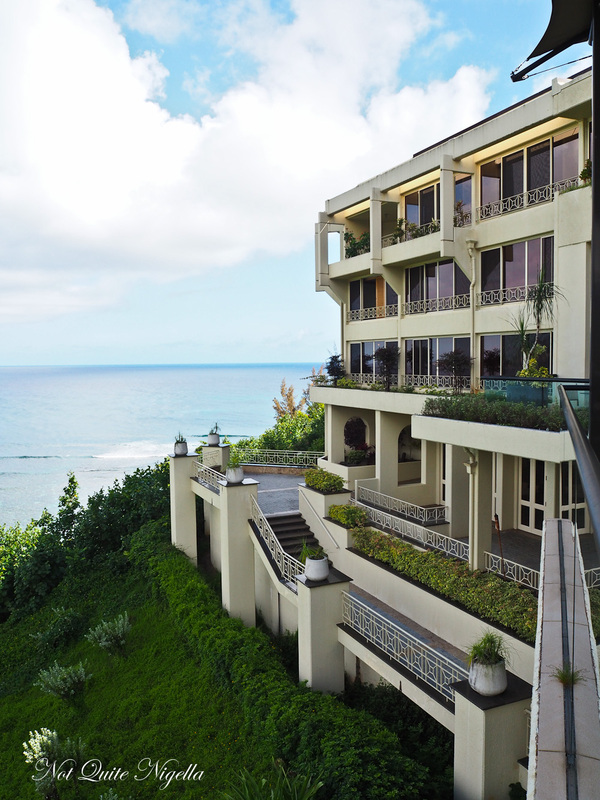 Located two miles into a gated community, the St Regis is the island's most exclusive address and it is an imposing and beautiful building that looks out onto Hanelei Bay. The hotel is built on a headland so the lobby is on the ninth floor. With a total of 250 rooms and 11 floors service still remains personal and extremely deferential. 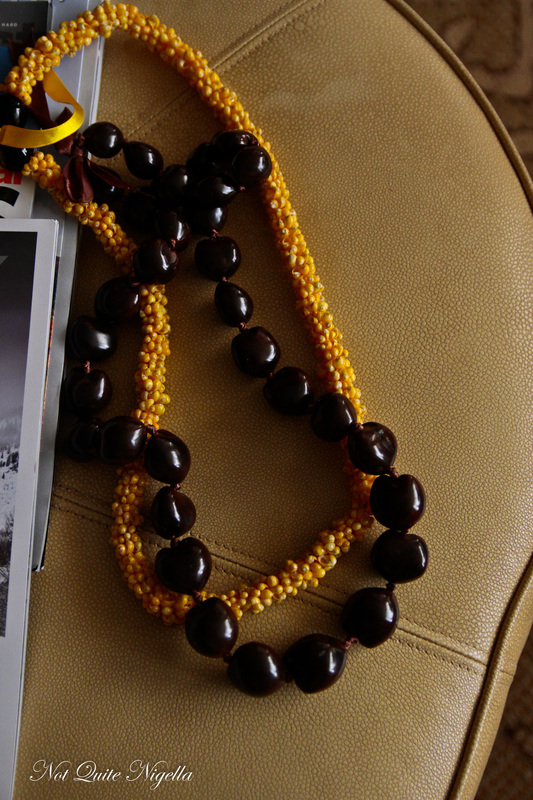 We are offered cold water as soon as we exit our vehicles and a yellow shell lei is placed on me while I am offered a kukui nut lei for Mr NQN. I'm asked to place it on him followed by a kiss. I'm barely finished admiring the lobby and then the view catches my eye. It's like a panoramic postcard come to life and the hotel is built to maximise these views. We take the elevator up to the 11th floor to our room #1122. It's a deluxe ocean view junior suite. 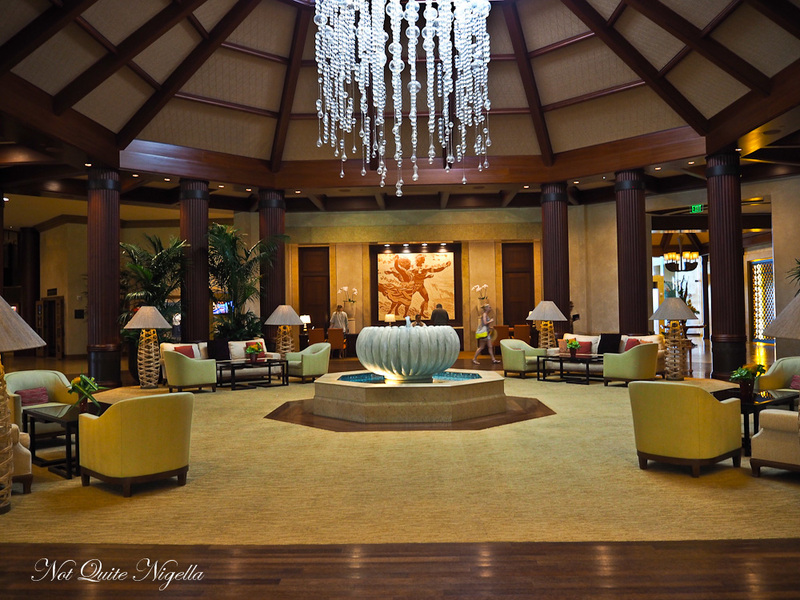 Measuring 820-square feet there is a crema marble entranceway and original Hawaiian artwork. The main bedroom and lounge room have enormous windows that you can open and the view outside makes it seem as though you are on a cruise ship sailing across the oceans. Next to the window is a small dining table for two and adjacent to this is a modular lounge and footstool. The flat screen television is hidden inside a cupboard along with a Bose music system and a wine chiller. I must admit that one thing that did bother me was the paper cups in every hotel room in a lot of hotels here. 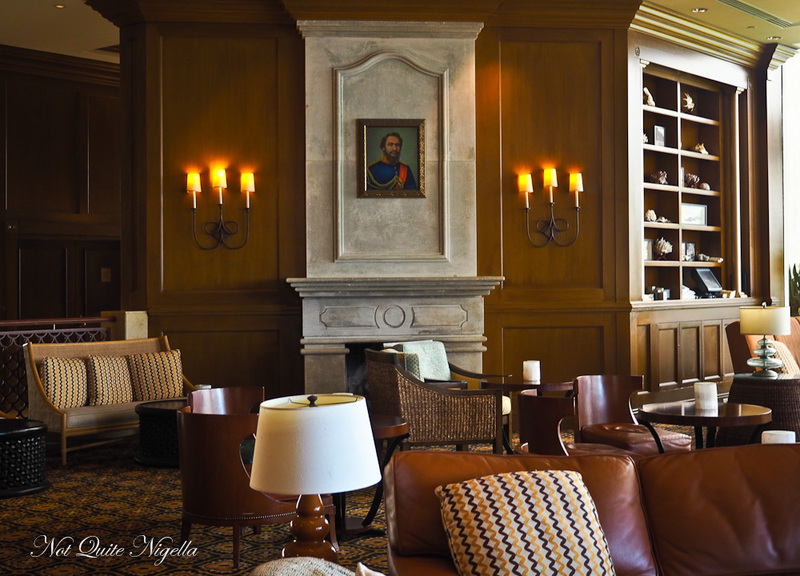 But at the St Regis they are ceramic cups and there is a coffee maker with coffee pods (alas no tea or fresh milk but these can be ordered from room service). The desk is large and to the right is a pop up flat screen television for bed bound viewing. Wifi is free and fast for up to five devices. 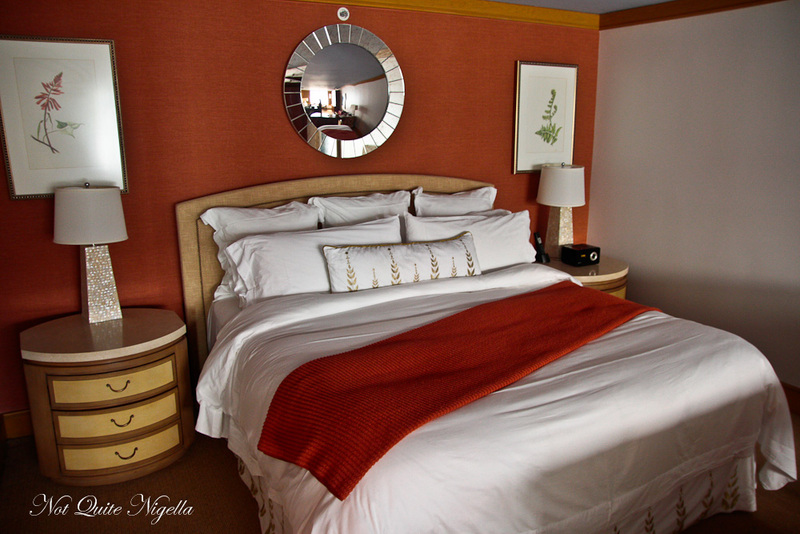 The king sized bed is very comfortable with 300 thread count sheets with pillows embroidered with a gold Hawaiian Maile leaf patterns. A framed message on the desk asks guests to pick up the phone should they have any feedback or concerns which is a nice personal touch. 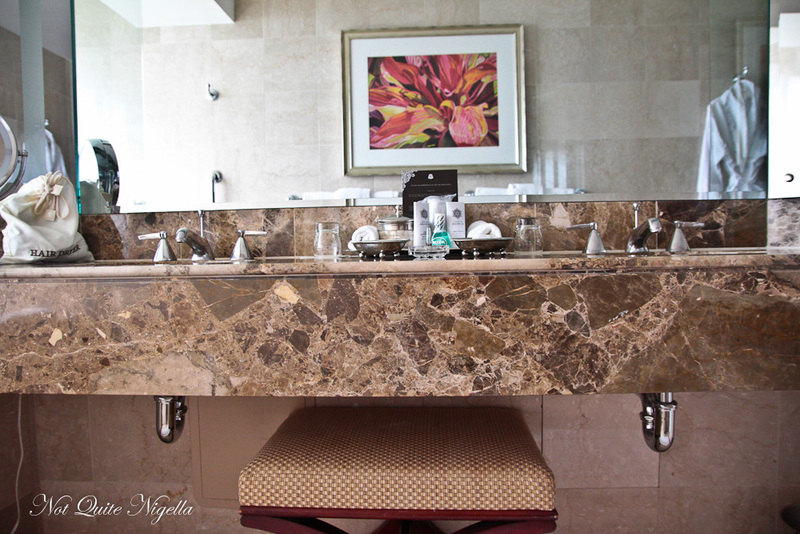 Venturing into the bathroom there are two sinks with a range of Remède produts and deluxe amenities including an age defying cleanser, full sized soaps, moisturiser, shampoo, conditioner, body wash, cotton tips and pads, a loofah and a over bath rack. And the cleverest feature here? 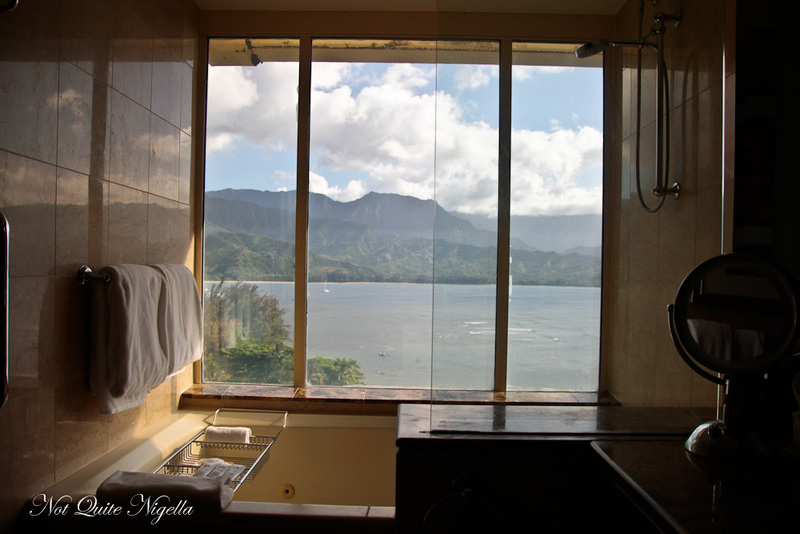 With one press of a button, the bathroom window can instantly be misted over for privacy! 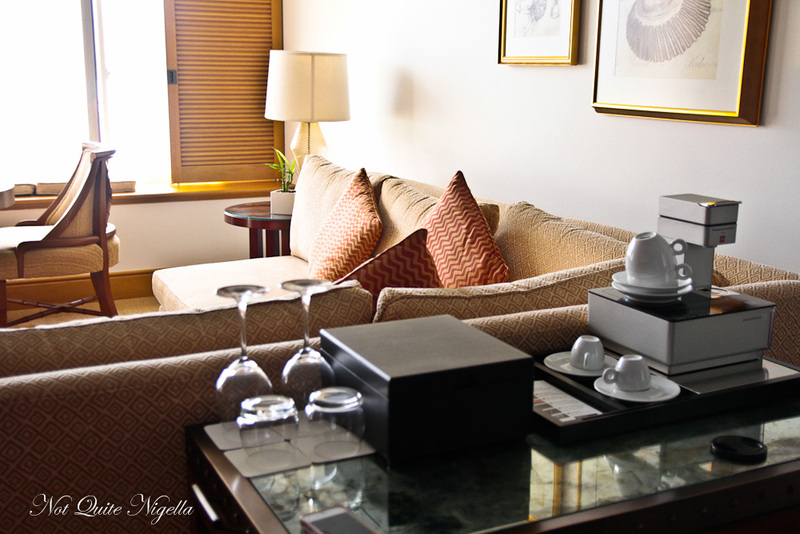 The junior suites also have access to the famous St Regis butler service. 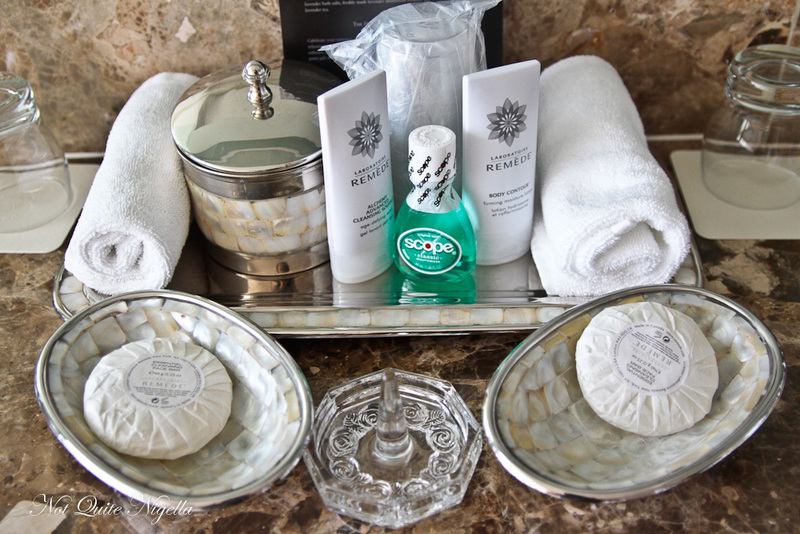 Included in your stay are the pressing of up to two items per guest per stay, a complimentary tea and coffee service in the morning and a delightful unpacking and packing service where your butler will unpack or pack up your luggage for you! And not only does the butler have a business card but so do the valets at the St Regis. I take a bath in the enormous tub and get ready for dinner. 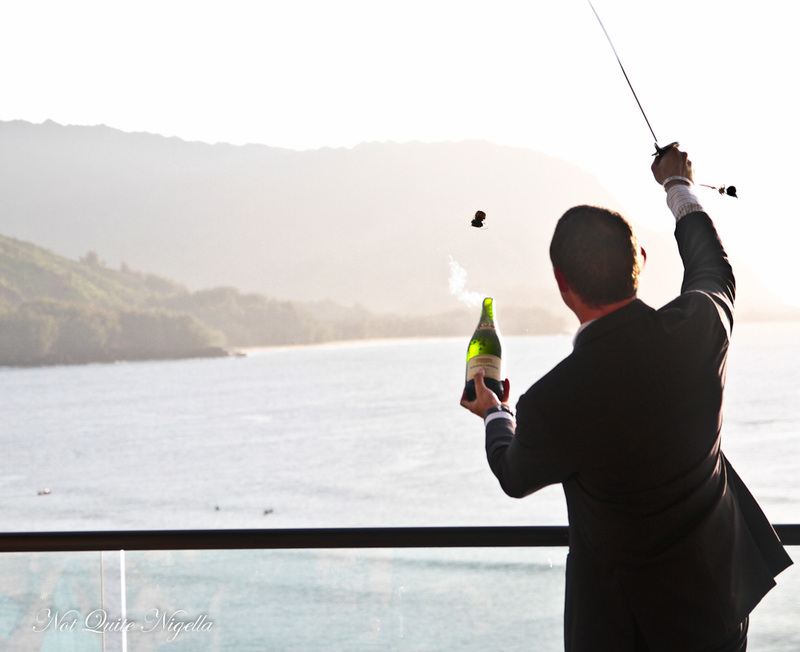 Just before sunset, every evening the St Regis performs a champagne sabering ceremony. This is when the sommelier takes a sword to a bottle of champagne and removes the top including the cork in one swift, smooth move. And up next is our dinner at the Jean Georges Kauai Grill! So tell me Dear Reader, have you ever used a butler service? Would you like the unpacking and packing service?